There must be over 100 different ways to make model trees. Almost every time I pick up a new railroad-modeling magazine, there’s another article about making trees. I think it would be confusing to put down all the methods for doing this on this page; though I may add more pages later on this subject. 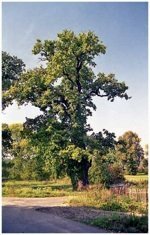 What I’d like to do here is show you my favorite ways to model trees – things that have worked well for me – and see if these ideas work for you for your model train scenery. One of my favorite ways to make evergreens for model scenery is the “pine cone method”. First, go out in the backyard or to a local park and collect a bunch of dropped pine cones. Select the ones that are a nice symmetrical shape. When you get home, put on some heavy-duty gloves and “shuck” the outer layer of wood “petals” off the cone so that you are left with the core of the cone. This has a rough surface, which is good. Also, the core is generally in the shape of a Christmas-type pine, though usually not perfect, which is also good. Then prepare a mixture of water and diluted white glue (Elmer’s) so that the glue is about the same consistency as milk (4 parts water: 1 part glue). Dip the cone-core into the glue, and then lift it out letting the excess glue run off the cone. If you prefer you could use a sprayer to spray the glue on the cone rather than dipping it in the glue. Then while holding the cone over a pan, sprinkle blended turf or dark green turf (ground foam) all over the cone. You could even dip the cone into a pan full of the ground foam if you like. Then shake off the excess foam. Static grass works very well here as well and actually can simulate pine needles when sprinkled on the tree. Drill a small hole in the bottom of the cone to insert a small headless pin or finishing nail so that the pin sticks out from the bottom by about an inch. If you like, you can drill a larger hole and insert a painted wooden dowel to serve as a trunk, although I think the tree looks fine sitting directly on the ground without the trunk in most situations. Then make a small hole in your layout surface and stick the completed tree on your layout using full-strength white glue on the base. Another method I like to use is to buy a large, inexpensive, bag of “bottle-brush”- type evergreen model trees in varying sizes made by Busch (available from online catalogs, if not in your local hobby shop). These trees look like bottlebrushes that have been trimmed in the shape of conical trees. You should trim them further to make them more realistic in shape. Then, once again, dip or spray diluted white glue on them, and then sprinkle ground foam all over them, one at a time, using the green or blended shade of your choice. You should change the shade or blend of the ground foam or turf that you use for different trees, or even on the same tree, in order to create variety. 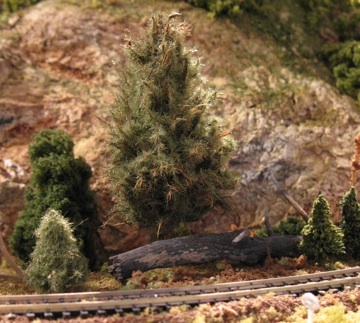 You can also buy evergreen model tree kits from Woodland Scenics, which contains tall flat pine tree stems and a bag of dark green clump-foliage. First you have to twist the flat tree trunk so that the branches line up at different angles. Then put a drop of full strength glue on each of the branches and let it sit for a few minutes to let the glue get sticky. Then take pieces of the clump-foliage and attach them to each of the small branches. Sometimes, you have to hold the foliage on the branch for a while till it sticks. When you’re finished, the result is fairly realistic. One method of making deciduous model trees that I like is to, again, go out in your backyard, and look at the twig structure of some of the small bushes. Break off some of these twigs and see if they will be able to stand alone as a tree on your layout. If it has a decent stem and lots of little branches coming off it, you can use it. If it doesn’t have very many little branches, put 2 or 3 of them together so that, if you were to wrap the stumps together, the resulting tree would have enough branches to look realistic. If you find some of these that you think would be appropriate for model trees, bring them in, apply white glue to the branches and apply clusters of clump foliage. Later, when this dries, you can add more clumps of foliage or you can spray the tree with diluted white glue and sprinkle on ground foam, perhaps using a slightly lighter shade of green than the darker clump foliage underneath for variety. Another favorite way to model trees is to first take a trip to your local craft store. 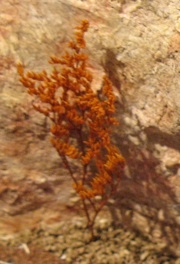 There, you can find all kinds of dried vegetation that you can use to look like trees, shrubs, vines, etc. with only a little modification. Some examples are peppergrass, baby’s breath (gypsophila), candytuft, and others. If you take peppergrass, for example, and put 2 or 3 of them together, they will have enough branches to make a fairly realistic tree shape. You can glue these together at the trunk level. Then, when they dry, you can, once again, use the glue-dip and sprinkle method as described above to add either clumps of foliage or layers of ground foam or both, depending on how thick you want the foliage to be. You should try to not make your trees too thick with foliage. Most of the time you can see through trees to the sky or sun in real life, so your model trees on the layout shouldn’t be too dense either. If you like, you can use an appropriate color of spray paint on your tree branches instead of glue and add the foliage while the paint is still wet. Also, for variety, you could use lichen on some of your tree branches and sprinkle blends of ground turf lightly over the lichen. The trunks should not be neglected. Your twig may have a good enough stem that it won’t need modification. If not, or if you’re putting twigs together as a bundle, you should apply clay or putty to the tree trunk, scrape irregularities in the “bark”, let that dry, and then paint it gray or brown. When you plant a tree on the layout, you can make it look like it has roots by using some Walthers "Goo" which is brown and thick; apply it to the bottom of the tree trunk, and then shape it with a toothpick so that it looks like a root structure. Modeling forests should begin with very realistic model trees in the foreground. You may want to spend extra time on these to make sure they look as realistic as possible. That way, the viewer then assumes that all the rest of the trees in the forest are as detailed and realistic as the ones in front.Behind the “good” trees, you can put in a lot of branches and underbrush and even some plain but detailed trunks without foliage on them that rise up into the foliage of the other trees so that it looks like your forest is denser than it really is. Then, behind that, you can have a raised area painted with dark green or earth brown, containing large clumps of lichen or polyfiber, or anything else that looks like tops of trees, and glue those to the elevated area. Add a light sprinkling of ground foam on top of the trees to look like leaves. Within the forested area you may wish to have a few rock formations and even a few open areas where you can see stumps and fallen logs within a clearing and maybe a few deer. Also, within the forest, place a few branches without foliage to look like dead trees. Generally, you should have the greater amount of detail close to the viewer and less detail further away. Here’s a great place to use forced perspective. For example, you could put an N scale house up on a hill in an HO scale layout, so that it looks, when viewed at eye level, like the house is much farther away than it really is. Also you should use progressively smaller treetops as you go up the hillside to get the same effect. If you want to model trees in the autumn, you should be careful when using the commercial autumn foliage products. They are sometimes too bright and garish to be realistic. You could start with green trees and add a light sprinkling of yellow or red-orange ground foam to the top and/or sides of the trees to give a hint that autumn is coming, or add more if autumn is definitely here.. You could add a light spray of diluted gray paint or Testor’s Dull-Cote spray to your more brightly colored trees to mute the colors a little, being careful not to get the paint spray on other places where you don’t want it. If you want to model trees for the winter season,it's best to use natural materials, twigs that you find outside, or dries branches that you find in craft stores. Glue 2 or 3 twigs together so that the resulting tree will have lots of branches. When that glue dries, you can glue on branches of dried baby's breath (gypsophila) to the tops of the trees to create even more small branches. Apply putty or plaster coating to the trunk. Then spray the whole tree with gray or gray-brown paint. You can add a very light sprinkle of brown or tan ground foam to a few of the branch ends to simulate dried leaves. You could also collect a bunch of dried leaves from your back yard, mulch them in an old coffee grinder, and use the mulched leaves to sprinkle around the ground of your bare trees to simulate the leaves that have fallen. 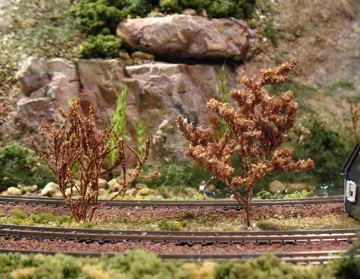 The dried leaves could also be used as ground cover for forests, or along side tracks or roads or creeks to add realism. Glue them down using the "wet" glue and pipette method as described in the Ground Cover page. What's YOUR favorite way to model trees? 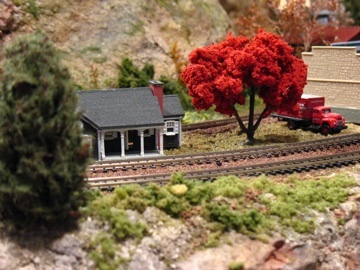 Lots of model railroading folks and diorama artists have their own favorite ways of making trees. What's yours? Let us know and we'll share it! Do you have a picture to add? Great! Click the button and find it on your computer. Then select it. (The maximum image size we can use is 800x600 pixels. If your picture is larger than this, you'll have to resize it using your photo software or a web-based resizer like Google's Picasa for PC or iPhoto's Export function for Mac). 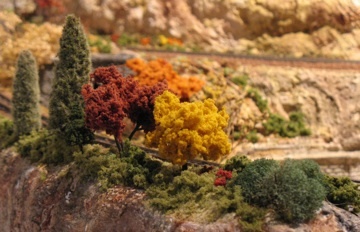 From "Model Trees" to "Model Train Scenery"
From "Model Trees" to "Homepage"